This is a follow-up to an earlier post is from an email conversation I had with a good friend of mine, Udo from AntWoord. As usual, Udo’s observations are penetrating and gracious. I’ve rearranged the conversation slightly as I think Udo should have the last word on this one. NOTE: If speculating about the intricacies of God’s providence isn’t your thing, skip this post and have a cup of tea instead. God knows that some people would not respond to special revelation. Some people do not have access to special revelation. Those who do not have access to special revelation are those who God knew would not respond to it. God knows that some people would respond to special revelation. Some people have access to special revelation and respond to it. Some people who have access to special revelation are those who God knew would respond to it. Other people who have access to special revelation, but do not respond to it, are those who God knew would not respond. But, argument 123 is identical to argument 4567 except for the fact that in argument 4567 some people have access to special revelation who do not respond to it. And since they do not respond to it, the effect is the same as if they didn’t have access to it. But now, why would you find 123 existentially unsatisfying whilst 4567 is presumably not? I do think that there is a difference in the existential experience of contemplating these two alternatives. In C there are many people groups who have never heard. Even though it may be reasonable for God to condemn these people to hell because of his middle knowledge, he is still condemning them for something they haven’t really done. It would be difficult for us to lay a charge of unfairness against God because of this, but it seems that this is not the way God acts in the Bible (I am open to correction.) I think of God telling Abraham that “the iniquity of the Amorites is not yet complete” in Gen. 15:16. He waited for them to complete it, even though he could destroy them for what they haven’t already done. This isn’t middle knowledge, but knowledge of the future, but that strengthens my case, I think. God seems to punish people only for past acts. On Howe’s view, we also ascribe to these people the guilt of not responding to general revelation. This means that we (with God) can comfortably shift these peoples to the sideline of God’s great story in history. The charge changes to ‘because they didn’t hear, they must be reprobate.’ I find this unsatisfying. Granted, William Lane Craig would disagree with Howe. My position is almost a restatement of Craig’s, except that I ascribe to all those without special revelation the dignity of being capable of responding to general revelation, so that God’s middle knowledge is not applied to the act of responding, but to their capability of response. Maybe it then ceases to be middle knowledge because capabilities/faculties are not in the subjunctive tense, but timeless? This is then the more difficult question. Why would God create people he knew would not respond? That isn’t the topic under investigation, and I would argue has no bearing on my answer. I don’t really know why God would create them. I would say that these people do have the capability to respond, and so their guilt is the same as those with only general revelation who do not respond. Furthermore, I think that these people would be indignant at the thought of God not creating them. They may prefer to exist (possible category mistake notwithstanding). God showers them with good things, gives them all the opportunities to love others and himself, and most have a good innings. Moreover, they contribute to society, and God’s ‘best possible world’ may not be possible without them. God pays them a huge compliment. If God knows that they will choose exile in the afterlife, should that give them veto power over his best possible world or their own happiness and existence? I don’t think the answer is clearly ‘no’. Let set E be the set of people who have access to special revelation. 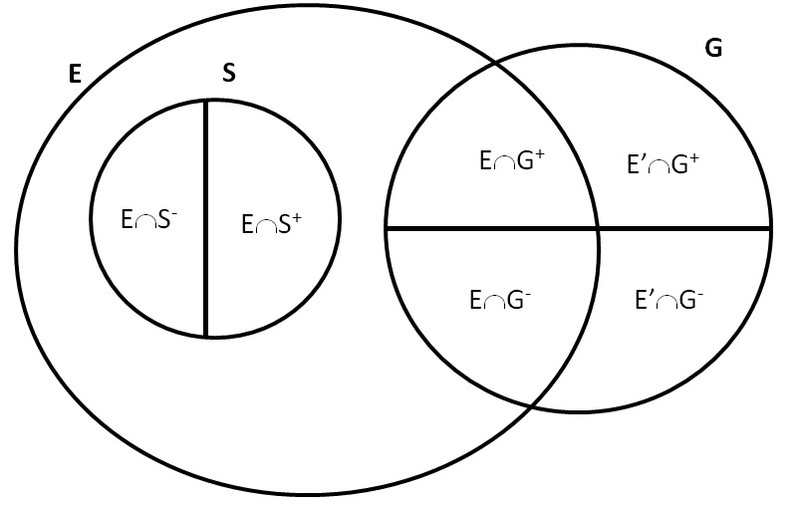 Let superscripts + and – indicate subsets of S and G where + denotes those who respond positively, and – those who respond negatively. The sets G and S are mutually exclusive and exhaustive. I.e., all people belong to either G or S.
God knows who belongs in G and who belongs in S.
G and E are independent though not necessarily exclusive. I.e., the distribution of the set G in time and space (w.r.t. special revelation) is irrelevant for their personal salvation, although other considerations such as the salvation of others may influence God’s decision on this distribution. Through God’s providence, S is a subset of E. I.e., God places those in S in times and places where they have access to special revelation. God knows that some people would not respond to special revelation in any feasible world. Some people who do not have access to special revelation are those who God knew would not respond to it (and are therefore living in times and places where they do not have access to special revelation). Some people who do not have access to special revelation, have access to general revelation or less than complete special revelation. Some people do not have access to general or special revelation, due to cognitive limitations (e.g. infants, mentally disabled), in which case one would expect God to still reveal himself to these human beings (we can only speculate on when and how, since the Bible is silent on this issue) without violating their free will (if the capacity to freely love or reject God is one of the essential properties of being a human person). Analysis 12-16 does need to make sense of Romans 10, but I don’t believe that Paul is making a pronouncement on the unevangelised there. It seems to me he is laying particular emphasis on the Good News that is to made known, for all true faith points to the God who sent his Son to die for the sins of the world, even if some people’s faith in God do not include explicit knowledge of this fact. It also seems that you think that God condemns people for not responding, but surely that is not the case. “Not responding” is merely the consequence of what is actually condemnable, namely rejecting God; in fact, people (1 and 7) condemn themselves because they prefer a life without God. At every moment their attitudes and lives are a demonstration of the fact that they are in rebellion to God and therefore not responding, whether to the general or special revelation of the God who is. There simply is no future act of not responding which is never actualized (simply because it is part of God’s middle knowledge) for which they are condemned. So you are right that God only condemns people for what they actually do and not for what they might have done but never actually do. But the molinist approach to people’s response or lack thereof in relation to their access to special or general revelation (whether in the 123 form, 4567 form, or 12-16 form) does not say that people are condemned for what they would do, but never actually did. It simply says that God knows that they would never respond, but judges them according to what they actually did. Furthermore, God’s foreknowledge of how people will respond to him, does not determine anybody’s ability to respond, nor is it the cause of what people actually choose if they have the ability to do so freely. You ask why God would create people he knows would never respond (which is different from saying that they could not respond). It might be the case that the existence of these people (people who would never respond in any feasible world that God could create) is necessary in that their existence contribute to creating the circumstances in which other people would respond favourably to God, so that, if they did not exist, then these other people would not freely respond to God. Well, just a few thoughts and comments that may need further justification or revision. This entry was tagged apologetics, revelation, soteriology, unevangelised, universalism. Bookmark the permalink.